A Facebook Escape Room Enthusiasts’ discussion reminded me that I’d not updated the London timeline since last August. The last six months have seen continued new openings, probably at a similar rate to the previous six months, but closures have dampened the relative growth a little. I don’t think that’s a major blip though. I believe (and hope!) we’ll see plenty of new rooms in the coming months. If you want to look at what I think the future might hold in a bit more detail, you can read my 2016 predictions. But you’re here for the pretty picture, so without further ado, here’s how London’s escaping scene has expanded. April: HintHunt opens its doors near Kings Cross and “John Monroe’s Office“, London’s first escape room, appears. June: Finally there’s competition in the capital, as clueQuest opens its first room, Plan 52, in Tottenham Hale. Feb: DifferencEngine and Dean Rodgers open “the Heist”, a temporary escape-style game running in Central London that will close in September of the same year. Mar: ClueQuest open a second room, Operation Black Sheep, bringing their total to three rooms. Hint Hunt open their second Zen room, bringing their room count to five. Escape Land open their doors in Cambridge Heath, East London with “Age of Steampunk“. Aug: Escape Rooms open, bringing us “the Pharaoh’s Chamber“. Escape Rooms open a second room, “Room 33“. Oct: The international franchise Escape Hunt, open their venue in the heart of the City, becoming the largest escape room venue in London with ten escape rooms of three different varieties, “Kidnapping in the Living Room“, “Murder in the Artist’s Bedroom” and “Theft from the Laboratory”. 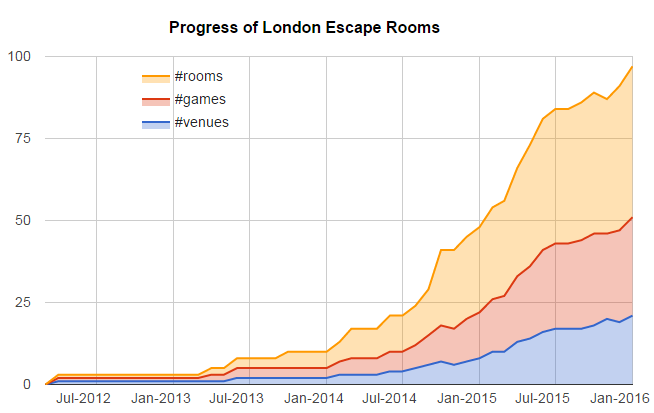 Dec: Room Escape Adventures opens the largest (occupancy) escape room in London, the first to offer individual tickets (rather than requiring groups to book the whole room out), the first to have an actor and the first to have a host in the room. “Trapped in a Room with a Zombie” is very, very different. Mystery Squad open the second outdoor London escape room company. With no fixed abode, games are available across zone 1. ClueQuest move to Kings Cross, to a venue suitable for up to nine rooms, and almost immediately enlarge to six rooms. Escape in Time open “Secret Studio“. Lock’d open a third room, “Perpetuum Mobile”. Enigma Quests open “the School of Witchcraft and Wizardry” – the second crowdfunded room in London. Escape Hunt close down and Escape Entertainment opens up in the same venue with six copies of “Bank Heist” and two of “Prohibition Pandemonium”. In some sense that’s no change to London’s make up, but for the raw figures we lost two rooms and one game. For one night only: a pop up mini escape room event organised by ThinkingBob. It doesn’t appear on the graph, but I think it’s worth of note. exitgames.co.uk and in particular, the monthly league table to check that I’d got things more or less right. The Wayback Machine (or the Internet Archive) for checking old versions of ClueQuest and HintHunt websites. Twitter and Gmail to check old tweets/emails on other sites. Next Post: What makes a good puzzle?